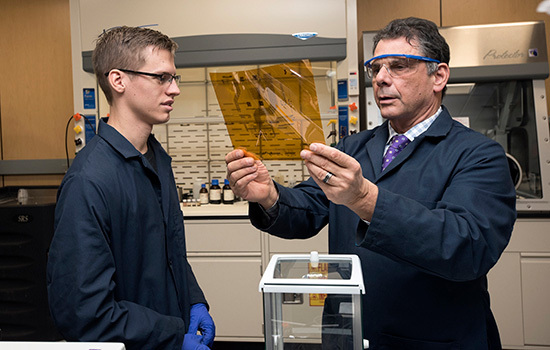 Student Tobias Hull, left, and Research Scientist Ken Reed, work in the AMPrint Center, using metal inks to create printed circuits for flexible electronics. While exploring a co-op position with RIT’s AMPrint Center, Tobias Hull began to wonder about a new kind of ink. Making nano-inks is a complex process that involves turning metal into powder, then using high heat to print them, followed by curing with a laser or 200-amp electron beam to sinter the inks so they form conductive properties. Reed and Hull are on that cutting edge, and taming copper may be one of the next barriers to fall to consider the metal as a viable and cost-effective alternative for 3D printing. Their solvent system for the copper ink produced can be used effectively in a printer because it has conventional printing properties—specific viscosity, thickness and surface tension. Copper is significantly lower in price than silver, and can be used for 3D printing wearable devices and RFID tags, for example. Both Reed and Hull understand what it takes to scale up their procedure so that it can be incorporated into widespread manufacturing processes. One of the more intriguing 3D-printed objects found in RIT’s AMPrint Center is a professional-size, black guitar, complete with six strings, frets and tuning key. It was printed in the center, and local musician Bob Schneider played it at the 2017 Imagine RIT Festival and at after-event jam sessions at the 2017 Xerox Rochester International Jazz Festival. Other examples of work underway includes 3D printing of different objects for seasonal displays being done by the center in collaboration with the Genesee Country Museum and RIT’s museum studies program. AMPrint Center faculty-researchers have skills in developing a variety of medical applications such as custom bone implants and inner ear drug delivery systems, have developed different prototypes of medical devices and pre-surgical planning models intended for use in minimally invasive robotic surgery, in addition to solar cells and wearable devices.